The South Karelia Museum and the South Karelia Art Museum have opened a new online exhibition on the topic of the Karelian Isthmus. It can be accessed at www.aikamatkakannakselle.fi. Extensive information on the Isthmus region—for example, old photographs and maps—has been assembled for the exhibition. The exhibition is primarily intended to cater to school children, which is why young people’s views have been solicited since the beginning of the design process. A group of eighth graders from Lappeenranta’s Kesämäenrinne School and their teacher, Anu Sihvo, promised to help. The students hoped, among other things, that instead of long texts the online exhibition would contain lots of pictures. “In addition, we proposed that some games would be involved,” Elina Lattu says. “And questions on the topic, which you can use to revise what you have read,” Henna Muukka adds. The exhibition, Time Travel to the Isthmus, is based partly on the major exhibition Barefoot: 10 Lives in the Karelian Isthmus, which is currently on view at the South Karelia Museum and South Karelia Art Museum. Scripted by Anna Kortelainen, Barefoot is based on ten life stories, which are also recounted in the online show. The online exhibition has been scripted by Pauliina Veijalainen. Time Travel to the Isthmus, however, will function independently. “In a traditional show, the perspective must be strictly limited. In the online show, we have, instead, the opportunity to present broader knowledge of the Isthmus region,” says curator Mona Taipale. On the Time Travel to the Isthmus website one can find, among other things, old photographs from all over the Isthmus, drawn from the South Karelia Museum’s collection. 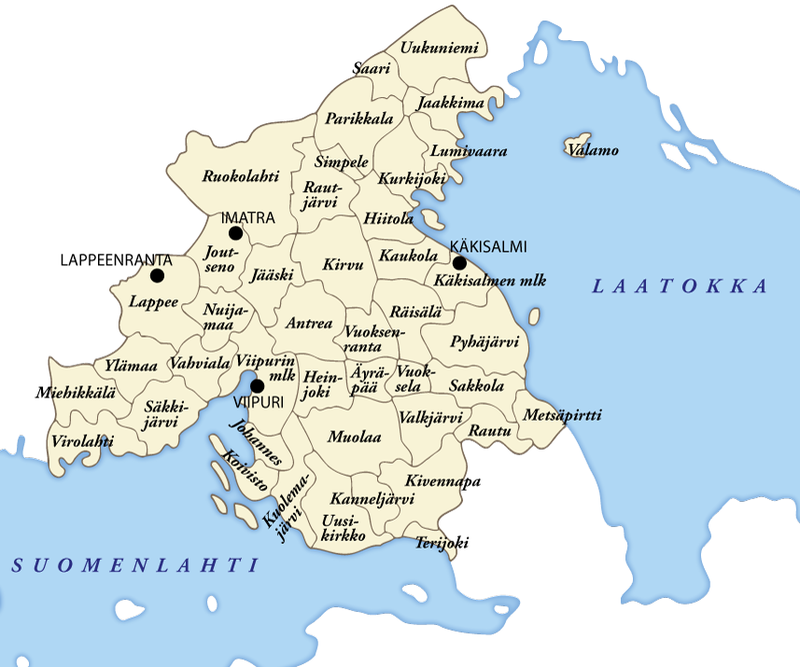 The history section, for example, contains a map of the parishes or rural municipalities (pitäjät) that made up the Isthmus during the period of Finnish rule. Online exhibition texts will also be available in Russian and English. Hence they can be used in history and language curriculum locally, nationally, and internationally. When the actual Isthmus exhibition wraps up early next year, the online exhibition will continue to function. The site adapts to different environments, so it can be used on a tablet or smart phone in addition to a computer. Translated from the Finnish by the Russian Reader. The text of the article has been slightly enhanced in a couple of instances to make it more comprehensible to non-Finnish readers.